A simple yet sleek design to bring you to the parties and get you all of the attentions. 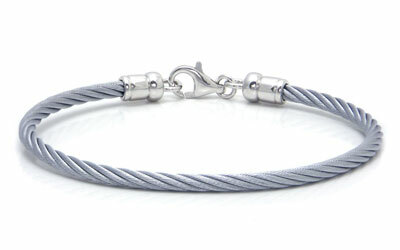 This stainless steel cable rope gives you an adorable bracelet which is very fashionable. Furthermore, it is combined with the shiny sterling silver, making it a splendid choice if you would like to shine your charisma all the way through. Because of the simplicity of the design, it would be really easy to combine the bracelet with most of your outfits.